It was during the reign of King Henri II that a bridge going from the Saint Germain Abbey right over to the Louvre Palace was first discussed, and the original plans were drawn up in 1556. 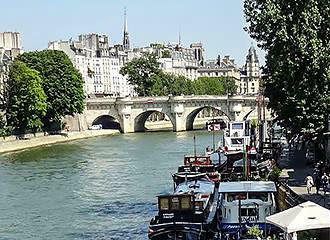 But the construction of a new bridge in Paris was opposed by the Provost of the Merchants and stall holders who had already set themselves up on other bridges over the River Seine, and they felt that this would be a bad move for them and that an additional bridge was not required. However, a few years later during the reign of King Henri III, the idea came up again as he wanted a grand bridge that would be impressive and make life in Paris easier for getting to and from the royal residence of the Palais du Louvre. And so, a group of engineers and architects was put together and the first stone was laid for the Pont Neuf in 1578 by King Henri III in the presence of the Queen Mother, Catherine de Medicis. Yet, things did not go smoothly as there was much political unrest, including the French Wars of Religion along with the Siege of Paris in 1590, which meant that all work stopped on the New Bridge. So after being halted for several years, the work did not restart again until 1598 during the reign of King Henri IV and eventually this bridge in Paris was finally completed on 20th June 1603 and met with resounding success. In fact, it was the largest and widest bridge over the River Seine and was completely different from any that had been constructed prior. 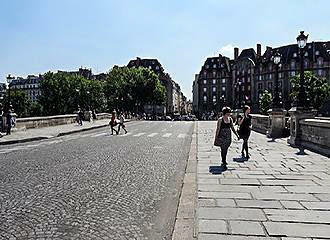 Plus it was the first bridge not to have houses constructed on it, which was so that the view over to the Louvre Palace would not be obscured, and this also meant that the Parisians were extremely happy with the outcome and it became a meeting place for many. But it was not until 1606 that the bridge was finally inaugurated by King Henri IV with the name of Pont Neuf, or New Bridge as it translates to in English, and it has still retained its name ever since and continued to provide fabulous views of the River Seine. 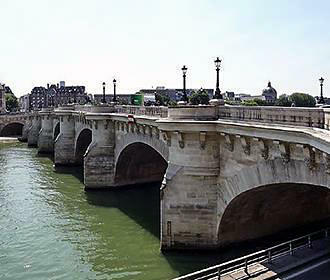 Although, the history of the Pont Neuf does not stop there as there was a pump constructed on the Pont Neuf above the second arch, which was to provide water from the River Seine for the local area and the royal residence of the Louvre, now called the Musee du Louvre. This pump housed in a pavilion, called La Samaritaine, was designed by the Flemish engineer Jean Lintlaer, and on the front of this there was a bronze gilded carving depicting Christ and the Samaritan woman, which is where the name came from, and on the top there was a bell tower and a very large ornate clock. The building or pavilion, was modified during the early part of the 1700s by Robert de Cotte, however, it was eventually demolished in 1813, yet many of you may recognise the name, as a large department store overlooking the Pont Neuf was named La Samaritaine by its founders Ernest Cognacq and his wife Marie-Louise Jay. And if you are interested, there are different museums in Paris you can discover relating to the history of Paris including the Musee Carnavalet that has information on the Pont Neuf and even a model of the Samaritan pump pavilion. But with the construction of the Pont Neuf that went from one bank of the River Seine to the other, at the tip of the Ile de la Cite island and embankment area was put in place where the two separate sections of the bridge would meet. 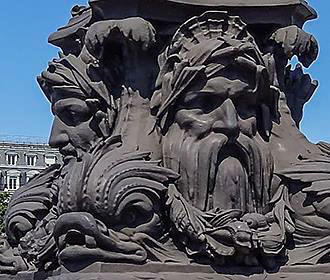 Unfortunately, King Henri IV was assassinated in 1610, yet his wife Marie de Medici had an equestrian statue of the king produced and this was put in place on this embankment area between the two sections of the Pont Neuf in his memory. This was actually the first royal statue to be erected within a public place, although regrettably the original equestrian statue of King Henri IV was melted down during the French Revolution, and therefore what you can get to see today, is an exact replica that was put back in place in 1818. However, part of the original from the pedestal base were saved from destruction and are now on display within The Louvre Museum.